As you look through the Cochrane Library > Schizophrenia and Psychosis you notice that the one thing you were hoping to find isn’t there but you know for a fact that there’s trials out there looking at that exact thing. 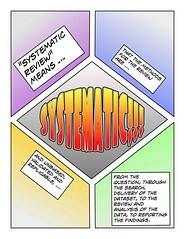 Why is there not a systematic review on that topic? Because you or another clinician have not contacted us to ask to write one, or perhaps it is being done behind the scenes you just don’t know it yet. As we have seen from Prescribing as a junior doctor: do we know what we think we know? and The Clozapine rollercoaster, systematic reviews are very important to doctors, they are also very important to patients, as they enable both to make an informed decision about how to treat schizophrenia or at least support recovery and stability. Unfortunately systematic reviews of drugs, therapies, ECT, hospitalisation procedures etc. don’t happen by magic. They happen because someone has contacted us with an interest they wish to pursue, to establish the usefulness of, with other like-minded people. Some clinicians contact us with an interest and then we help them find their team, others get a team of people together themselves. They come to us with a title such as Drama therapy for schizophrenia or schizophrenia-like illnesses or Antipsychotic drugs for elderly people with late-onset schizophrenia and present us with a proposal for how they will review the topic. Our stringent Editors will then look over the proposal and make recommendations for inclusion or removal, or maybe they’ll just say “Amazing! Do it!” before the title is registered with the Cochrane Schizophrenia Group. Before the clinicians, or as we now call them new ‘Review Authors’, begin their review there is an initiation. Lucky for them it’s not a dirty pint, rather a peer review of someone else’s Protocol review (the plan for the full review minus stats) in the ‘Editorial process’ or a published Full Review that needs some fresh eyes to look over it. Some people just want to help out with peer reviews, which is great. We love peer reviewers! How else can we improve the quality of our reviews without the help of clinicians, patients or carers of people with schizophrenia? You’re the one’s who use our reviews, who best to peer review them to make sure they meet your needs and that we’ve steered away from bias in our reporting. Unfortunately not many people contact us to be peer reviewers [sad face]. Where are you all, don’t be scared, we’re always here to support you throughout the whole process. Give us a call, email or even Skype. Anyway, sorry, I got a bit carried away there with my plight for peer reviewers. Once the review team has got the go ahead they can begin. Let the reviewing commence! We provide the trials (not to say you can’t look for your own), a review template to work from, an online systems (Archie, RevMan, GRADE Pro) in which to create the review and stats tables (we all want the simple life) and of course lots of support. You’ll have access to an Editor to support you through the process, and there’s the whole of the Base team (me included), you can even attend a Cochrane Systematic Review Writing course (definitely recommended). The courses are usually held in Nottingham but we have our connections [wink wink] to enable courses to run elsewhere, such as China (contact Jun Xia for details). More importantly, you’ll also get access to our closed LinkedIn Group to chat to your peers on best practice, any difficult areas you experience throughout the process, or just to comment and discuss our tweets fed into the Discussions. Protocols should take about 6 months to complete, while a Full Review should take about 1 year to complete. What happens in that time? It’s not just you comparing and writing, oh no. It’s us too, the Base team managing the admin processes such as collating Conflict of Interest Forms, comments from Peer Reviewers and Editors, proof reading etc. ; your ascribed Editor reviewing the progress at certain points and commenting; one or more Peer Reviewers from various backgrounds commenting on your review; a Plain Language Summary writer (usually a consumer with schizophrenia) to summarise in real people terms what you’ve reviewed and concluded; and the Coordinating Editor, Clive Adams, who provides the final overall sign-off. Once everyone’s played their part in bringing together your review it goes for publication, which takes about two months from submission. 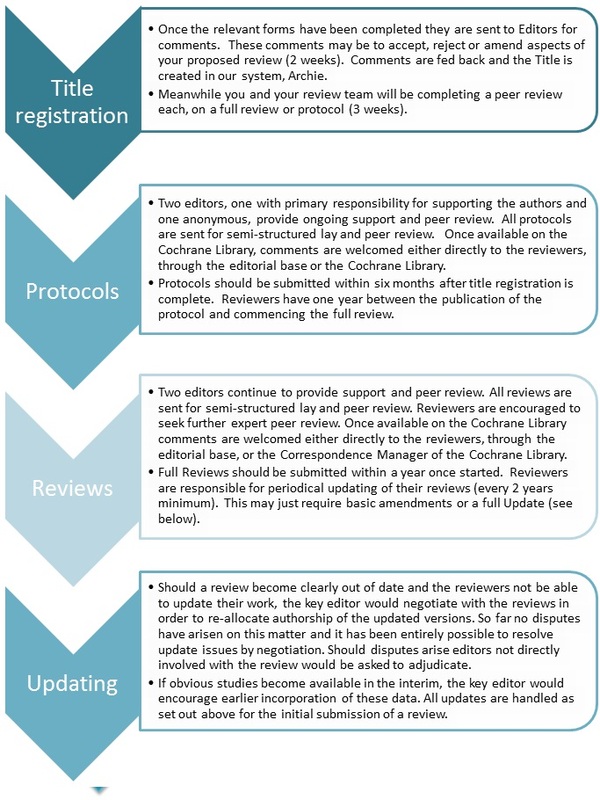 It will then appear on the Cochrane Library and the Cochrane Summaries. Yay, it’s complete. What you have to remember though is that you, the review team, have made a commitment to this review. It’s your baby. Luckily you don’t need to change it’s diapers every day, but what you do need to do is pick it up every 1-2 years to check it’s still up-to-date. In that time, if a peer reviewer we’ve recruited looks over your published review and identifies some significant issues to be addressed or we come across some new trials you may need to update it a bit sooner. We’re reasonably flexible, you just need to talk to us. So, who wants to join our team as a Peer Reviewer or Review Author? Hit us with your best title! For more details on the review process and the difference between a Protocol and Full Review see our website.